Facts about Black Fin Damselfish. The Black Fin Damselfish is a member of the Pomacentridae family and is sometimes called the black damselfish, yellow back damsel, blue fin damsel fish, bow tie damselfish and royal damsel. The fix is a mixture of blue, black and yellow. The young fish are gray with yellow dorsal fins and black pectoral fins. As it matures, the Black Fin Damselfish turns entirely black. The coloring is not as dramatic as some other damsels, but it is also a cheaper fish to buy. The Black Fin Damselfish will be one and a half inches (1.2 cm) when it is a juvenile and the most colorful, and its maximum length is five inches (12.7 cm). The Black Fin Damselfish needs at least fifty gallons of water, and more if you have more than one Black Fin Damselfish because they are aggressive as adults, though the juveniles are more peaceful. The Black Fin Damselfish are solitary except for the rare times they meet to breed. The Black Fin Damselfish is not only aggressive to other members of its species and other damsel fish, Black Fin Damselfish is aggressive to everything. Given time, it will establish a territory and only attack other fish during feeding time or when one tries to encroach on its hiding/resting place. This is, conversely, one of the few fish that can share a tank with an eel. The water should have a pH between 8.1 and 8.4, and the water’s specific gravity should be 1.020 to 1.025. The Black Fin Damselfish do best in water that is 70 to 80 F. A higher temperature will speed up its metabolism and increase its feeding needs. This Indo-Pacific Ocean native is an omnivore. In the wild, the Black Fin Damselfish feed on soft corals. They will eat living shrimp in the tank and nip at soft corals. Feed them mysis shrimp, sliced clam and other meaty foods along with fish flakes. 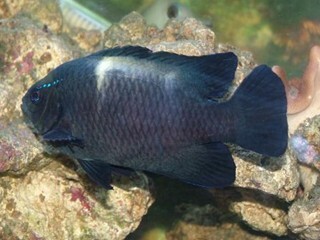 The Black Fin Damselfish will eat almost type of fish food. Test the water when preparing your tank for your Black Fin Damselfish: You will need to purchase a liquid tester so that you can test for Nitrates and Ammonia. The strip-style test kits are unreliable and a waste of money. You should use a dechlorinating product to remove the harmful chlorine from the water. Test for nitrite, ammonia, and proper PH. The ammonia should always be 0, the nitrite should be 0, and the nitrate should preferably be below 20 ppm. If it's at or above 40 parts per million (ppm), you have too many fish or are not changing the water often enough. Cycling your tank is important, Follow the steps to cycle your tank. This establishes healthy bacterial and chemical levels. Remove 30% of the water from your Black Fin Damselfish tank each month with new water, or a 15% water change every 2 weeks is ideal for keeping nitrates lower. With corals in the fish tank, then 20% water change every month, or 10% change every 2 weeks. The Black Fin Damselfish is easy to take care of. It is considered one of the better fish for beginners since it will survive many water quality problems new aquarium owners face.